LA QUINTA, Calif. -- When La Quinta Resort and Club opened in 1926, it provided a unique escape set in the shadows of the Santa Rosa Mountains for some of the biggest names in Hollywood. The Plaza in the heart of La Quinta Resort serves as a hub for dining, shopping and entertainment. Nearly 20 miles south of celebrity enclave Palm Springs on Interstate 10, it was a destination, by any definition, to those who chose to venture into the new desert oasis in search of refuge from the movie studios and privacy from fans. Today's La Quinta Resort celebrates the well known history, while incorporating the high-end amenities to which visitors have become accustomed. Vintage cars sit in the driveway, flanked by Ferraris. Classic movies, idealized decades ago at the resort, project on to the outside plaza. Live Spanish music and jazz tunes fill the evening for those enjoying cocktails around fire pits. For all these reasons and more, La Quinta Resort was named North America's 2010 Golf Resort of the Year by the International Association of Golf Tour Operators, the global trade organization for the golf tourism industry. It seems that once guests visit the property, they're immediately planning a return trip. A quiet stroll through the ranch-style property reveals nearly 800 rooms spread across 45 acres, accented with groves of citrus trees. Red-tile roofed casitas, suites and villas are available, with most surrounding one of the resort's 41 pools and 53 jacuzzis -- often a stone's throw from the room's door. The rooms are appointed with gas fireplaces, plasma televisions and upscale linens, while bathrooms feature deep soaking tubs and large stall showers. Want to step back into a more simple time? Stay in one of the original casitas built in 1926. You could sleep in the same room where legendary movie director Frank Capra penned cinematic masterpieces like "It Happened One Night" and "It's a Wonderful Life." Capra considered La Quinta Resort as his inspiration and good luck charm. Morgan's in the Desert, the resort's high-end restaurant, opened in 2009, but its popularity has quickly grown as a local destination and for guests who seek a memorable experience. James Beard award-winning chef Jimmy Schmidt creates seasonal menus that include salads, seafood, pastas and more, paired with eclectic and thorough offerings of wine and cocktails served in the Piano Bar, main dining room or on the fire-lit courtyard. Paul Douglas, a former band member for both Bruce Hornsby and Kenny Rogers, performs Wednesday through Saturday, strolling through the restaurant among diners to play his acoustic guitar. Try the best tamale, as awarded at the 2010 Indio Tamale Festival, at Adobe Grill, which serves regional Mexican cuisine. Fresh guacamole is made tableside from all-natural ingredients, and tortillas are handmade thick. Order one of 50 different types of tequilas from the bar while sitting on the patio above the white-light studded La Quinta Resort Plaza. For more casual fare, Twenty6 offers a great sports bar-style option beneath Adobe Grill, serving classic American cuisine like burgers, ribs, salads and a much-discussed reverse soda float for dessert that includes root beer, grape crush and orange crush creamsicles for a touch of nostalgia. The clubhouse for La Quinta's Mountain and Dunes golf courses features a revamped menu that treats visitors to a fun variety of burgers and milkshakes along with fireplace, plasma TVs and golf-course views, while Ernie's Bar and Grill at PGA West satiates the libation taste buds with several premium beers on tap. 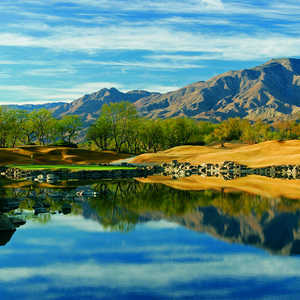 La Quinta Resort is well known for its Pete Dye-designed Mountain course and Dunes course -- the Mountain named as one of Golf Magazine's Top 100 Courses You Can Play. 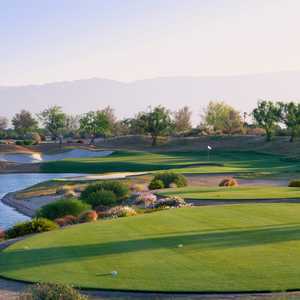 Not a sound can be heard from some of the back-nine holes on the Mountain Course; its idyllic setting among the iconic mountain ranges of Coachella Valley provides, arguably, some of the most peaceful holes in all of southern California. Combined with PGA West, which celebrates its 25th anniversary in 2011, La Quinta Resort offers golfers five public golf courses. The TPC Stadium Course, Jack Nicklaus Tournament Course and Greg Norman Course round out the public offerings. Another four golf course are available for members only. If guests are looking for it, it's likely La Quinta Resort has it. The 23,000-square-foot Spa La Quinta beckons travelers who seek relaxation with a full selection of body and face treatments. The Native Elements body scrub is supreme, as well as the massages. A quick dip in the jacuzzi or some time in the steam room is popular with spa visitors, too. Practice your backhand on one of the resort's 23 tennis courts, where you may spot a celebrity or two. Direct by past David Cup captain and coach Tom Gorman, the resort's tennis facility -- which includes five clay courts and 18 hard courts -– ranks one of the top 20 U.S. tennis resorts by Tennis Magazine. And after a long day of activities, some retail therapy can be had at the La Quinta Resort Plaza. You'll find Polo Ralph Lauren, Brighton and Tommy Bahama among the resort's popular apparel and accessories shops, while a general store, children's store and art gallery are also open for perusal. Shops wrap around the lower-level plaza off the main drive, the perfect location to take in the resort's charm. After a day or a week at La Quinta Resort, it's difficult to drive away across its quaint, red pavers, surrounded by orange trees beneath sparkling white lights. But for all that is done -- and all that is left to see and do -- that return trip to the desert's legendary property arrives sooner than many guests expect.